News and events that have passed will be archived here for future reference and will be available to view for the duration of the project. The exhibition Chiefs & Governors: Art and Power in Fiji is now on-line at http://maa.cam.ac.uk/maa/about-the-exhibition. The webpages include photographs and detailed information about over 250 objects, exhibition texts, a slide show of the exhibition, and a film of the opening. The Fijian Art research project is drawing to its official close on the 30th April 2014, after three busy and highly productive years. The MAA exhibition Chiefs & Governors: Art & Power In Fiji will close to the public on Saturday 19th April, after considerable public and critical acclaim. Research, collaborations, publications and others project outcomes will continue for some years to come, however. Foremost among these is a major exhibition of Fijian art, the largest ever staged, which will be curated by Prof Steven Hooper. This exhibition will open in 2015 at the Bundeskunsthalle in Bonn, Germany, before moving to the Musee d'Ethnographie in Geneva, Switzerland, and closing at the Sainsbury Centre for Visual Arts, University of East Anglia, UK, in 2017. At this year's conference of the Museum Ethnographers Group, the Fijian Art project's Principal Investigator Steven Hooper will deliver a public lecture entitled 'Collecting Fiji: Gordon, MacGregor and the Aberdeen Connection'. This lecture will reflect on several Scots, including Sir Arthur Gordon, his cousin Arthur Gordon and Doctor William MacGregor, who were based in Fiji during the establishment of British colonial rule in the 1870s. In particular it will focus on their collecting activities and on some of the remarkable artworks they later donated to the University of Aberdeen. 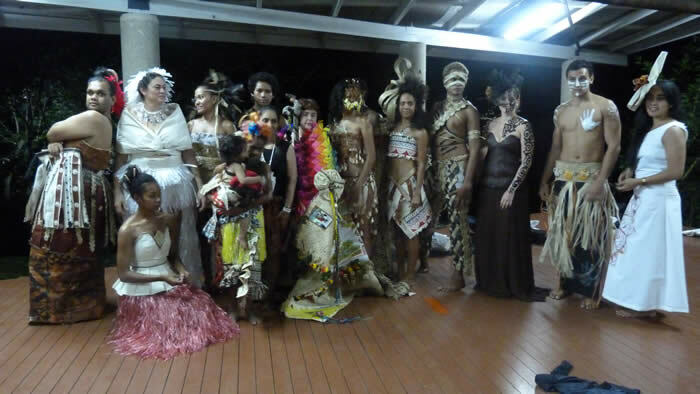 First held in the UK in conjunction with the London Pacific Fashion Show in 2012, and independently followed up at the 2013 Pacific Arts Association conference in Vancouver, the third in the global series of workshops took place at the USP and coincided with the exhibition Art and the Body currently showing at the Fiji Museum. 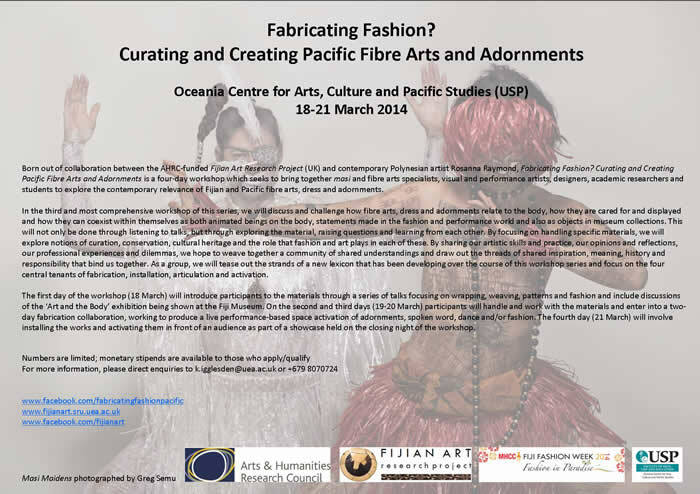 Hosted by the USP's Oceania Centre for Arts, Culture and Pacific Studies, and benefitting from the sponsorship from the Fiji Museum, Fiji Fashion Week, The British High Commission and the USP, in addition to the UK's Arts & Humanities Research Council and the Fijian Art project, this was the most comprehensive of the three workshops. Above: The workshop announcement. Below: Rosanna Raymond discusses her fabrications, installations and activations at the workshop (photo: Karen Jacobs). 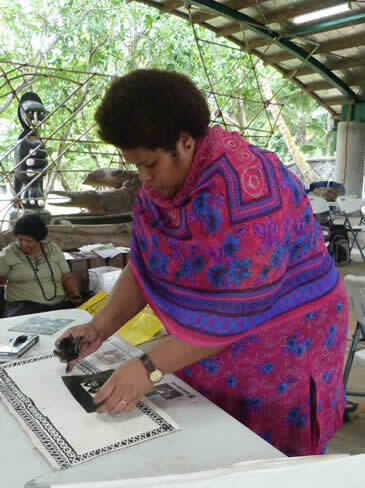 Above: Selai Buasala showing her masi making skills at the workshop. Below: Mereia Lesi stencilling masi. Bottom: The workshop's finished fabrications (photos: Karen Jacobs). The collaborative Fijian Art project-Fiji Museum temporary exhibition Art and the Body: Exploring the Role of Clothing in Fiji opened this week in Suva. The exhibition is arranged in four sections which highlight connections between clothing and the human body: Clothing and gender, Clothing and power, Clothing and performance, and Clothing transformed. Special clothing was, and is, used for those involved in important rites of passage, such as birth, important birthdays, initiation, chiefly installation, marriage and death. Clothing and body adornments are worn to express status and sau (power). They are therefore made of valuable materials, such as masi (barkcloth), whale ivory and shell. The exhibition follows a chronological order with a focus on key moments in Fijian history, such as the arrival of missionaries in the 1830s-40s, and the signing of the Deed of Cession in 1874 when Fiji became a British colony. Photographs by Rob Wright and Steven Hooper are included to show events in the 1940-50s and 1970-80s. The exhibition ends with a focus on dynamic developments in clothing and fashion today. Top: The exhibition poster, featuring a photograph of dancers taken in Lau during the 1970s by Steven Hooper. Above: The completed exhibition photographed in panorama (photo: Bethany Matai Edmunds). 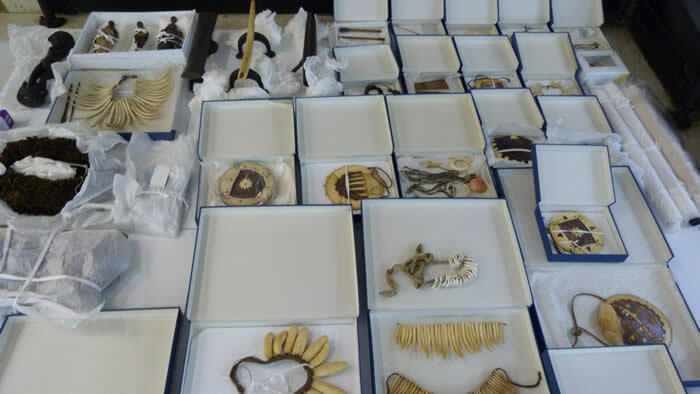 Below: The completed Clothing & Gender case, featuring fine quality masi, rare shell pendants, ear ornaments and iyau (photo: Karen Jacobs). 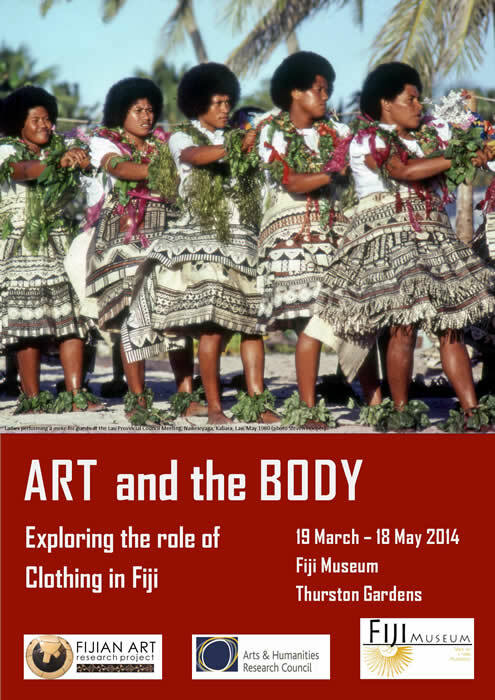 The Fijian Art Project team is honoured to collaborate with the Fiji Museum in curating the upcoming exhibition Art and the Body: Exploring the role of Clothing in Fiji. This show will celebrate indigenous Fijian clothing and body ornaments. 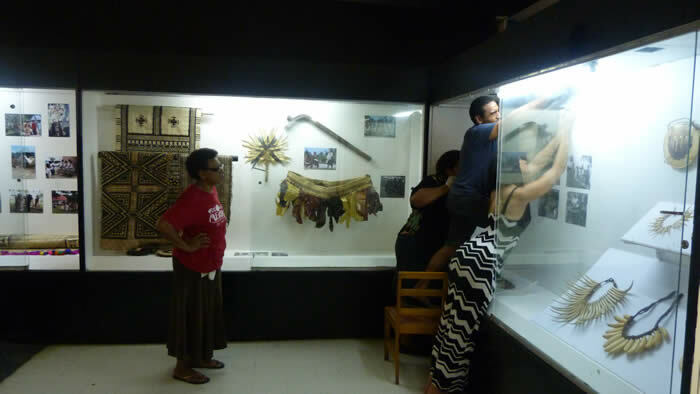 The Fijian Art project's Karen Jacobs, Katrina Talei Igglesden and project associate Rosanna Raymond, are installing the exhibition with the assistance of Fiji Museum staff. The exhibition will give the visitor a glimpse of the wealth of valuables that the Fiji Museum looks after. Above, L-R: Roxy, Mereia, Sakiusa and Katrina installing masi in one of the Clothing and power cases. Below: The wealth of ivories in the Fiji Museum left the curators spoilt for choice. 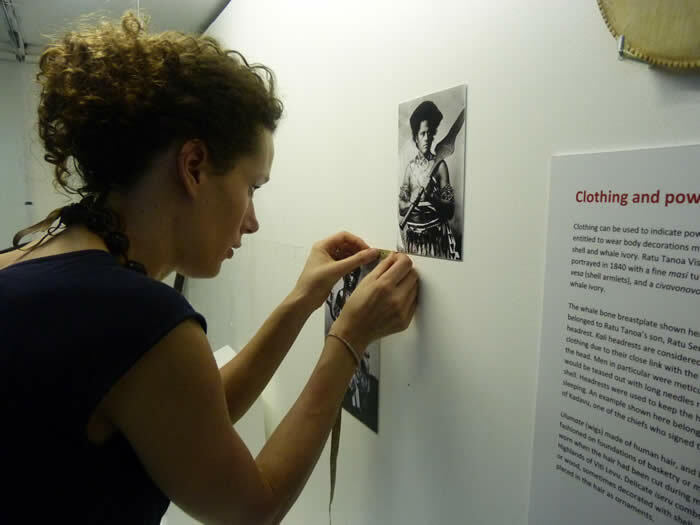 Bottom: Karen installing historic photographs selected from the collections of the Museum of Archaeology & Anthropology, Cambridge (photos: Karen Jacobs and Rosanna Raymond). 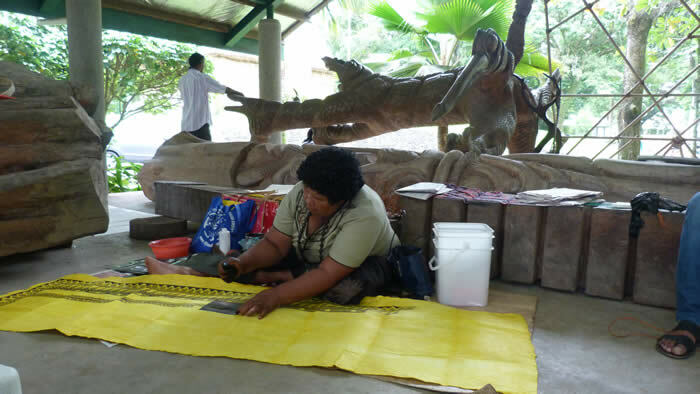 On Saturday 15 March, staff from the MAA in Cambridge hosted a popular public event entitled Fijian Barkcloth Unwrapped. 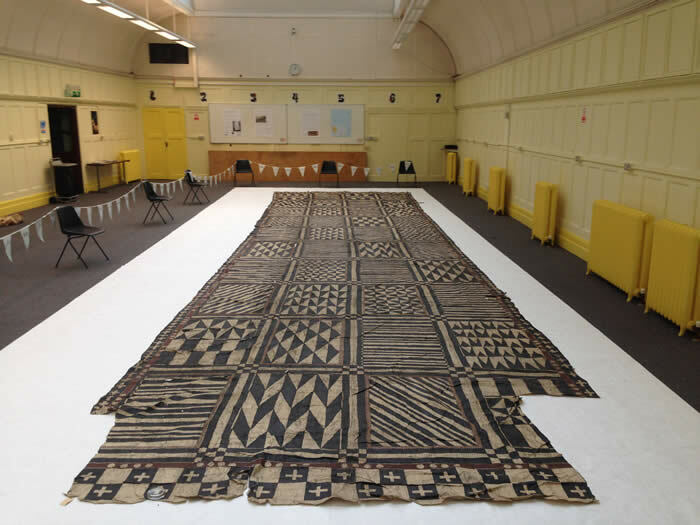 This event in the Small Exam Hall of the Arts School (two minutes’ walk from MAA) revealed, for the first time in a generation, an extremely large Fijian barkcloth in the MAA's collection. 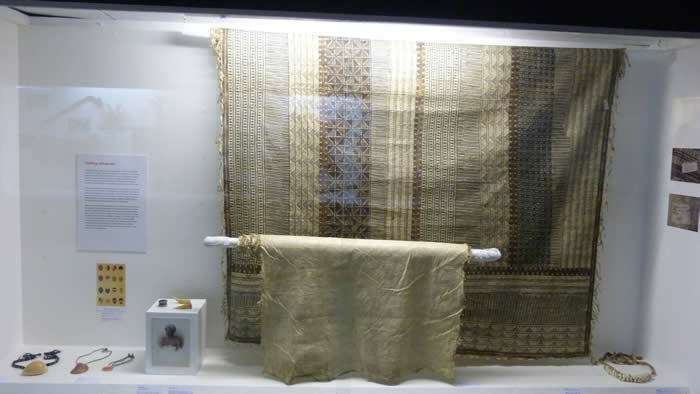 Almost fifteen metres in length, this barkcloth was part of a presentation by the Tui Cakau, Goleanavanua (paramount chief of the powerful northern chiefdom of Cakaudrove) to Sir Arthur Gordon (the first British Governor of Fiji). Cakaudrove has long been renowned for its striking and aesthetically strong barkcloth designs, and this magnificent cloth formed part of the ceremonial presentations made to the Governor at the very first meeting of the Great Council of Chiefs, held on 12 December 1876. Its political significance was considerable, as Goleanavanua had been one of the most outspoken critics of cession in the lead-up to British annexation in 1874. Above: Tui Cakau's train, unfolded and placed on display for the first time in more than twenty years (Photo: Lucie Carreau). Below: Project staff Dr Lucie Carreau and Prof Steven Hooper examine the masi closely before the hall is opened to the public (photo: Anita Herle). 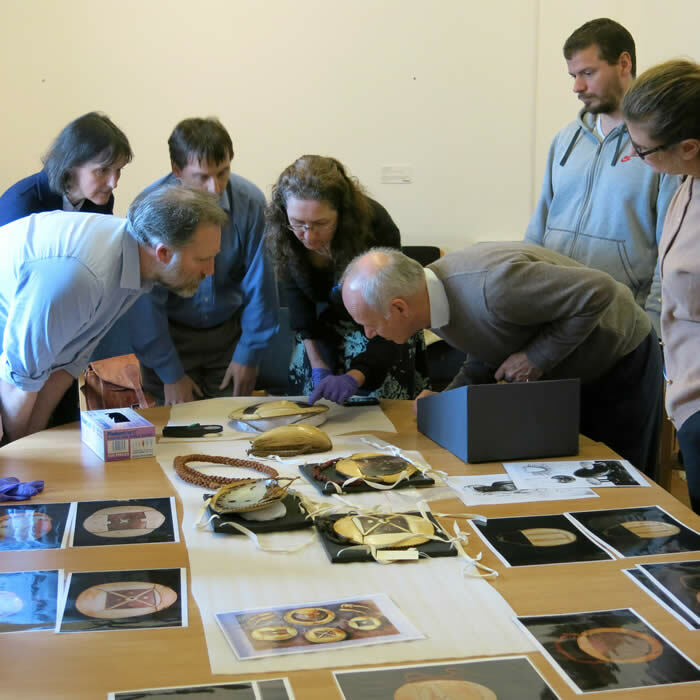 On Monday 10 March, staff from the MAA in Cambridge ran one of their Collections Confidential workshops. The workshop explored one of the museum’s most treasured valuables – a breastplate which formerly belonged to Ratu Tanoa Visawaqa, the Vunivalu of Bau and father of Seru Cakobau. 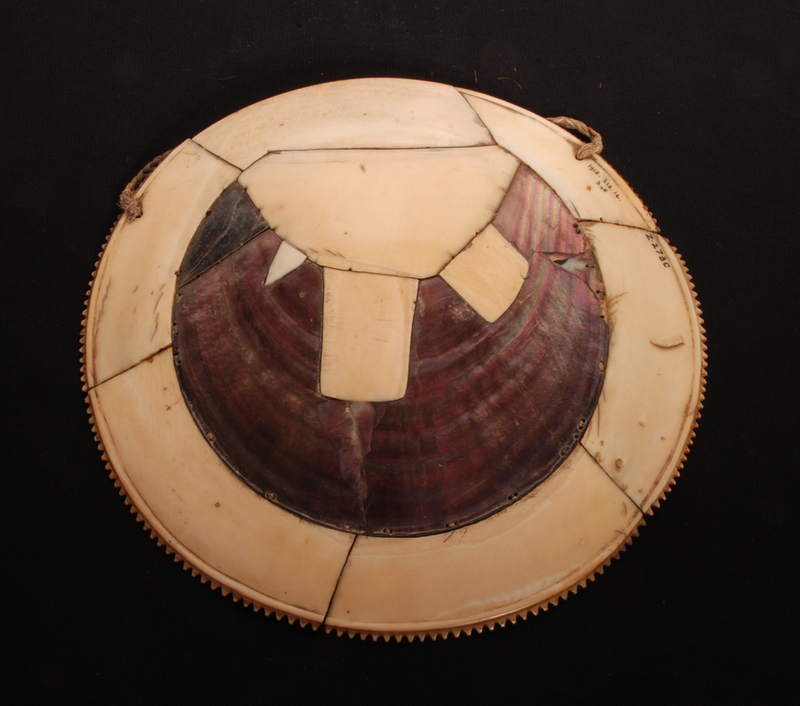 Entitled Whale Ivory and Chiefly Power - the Life of a Fijian Breastplate, this workshop provided a rare opportunity for visitors to have a very close encounter with one of the most outstanding Fijian breastplates in the world. 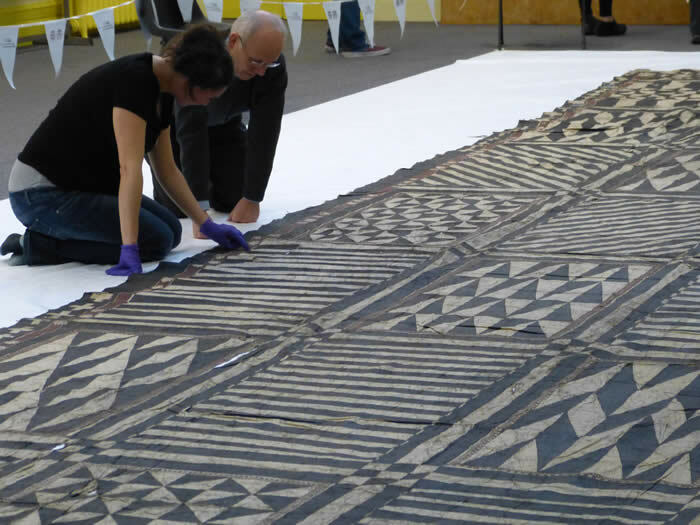 The workshop combined insights from recent historical research and analysis by conservators which has revealed fascinating new insights about the movement of people, objects and artistic skills across Western Polynesia. The event featured a gallery talk by the curators of the exhibition Chiefs & Governors: Art and Power in Fiji. Above: Ratu Tanoa Visawaqa's famous civavonovono breastplate, MAA Z2730 (photo: Jocelyne Dudding). Below: Project staff, academic researchers and members of the public examine Ratu Tanoa's breastplate, historic tabua and other ivory works. The Fijian Art project’s principal investigator, Professor Steven Hooper, delivered this year’s Von Hügel Lecture at Cambridge University on Tuesday 4th March at 5pm. This prestigious annual lecture was established in memory of the Museum of Archaeology and Anthropology’s founding curator Baron Anatole Von Hügel, who lived in Fiji between 1875 and 1877. Entitled Fijian Journeys: von Hügel, chiefs, culture and canoes, Professor Hooper’s lecture encompassed research on Von Hügel’s life and collections in Fiji during the late 1870s, Hooper’s own three years in Fiji a century later, and his recent research for the Fijian Art project exploring fine ivories and canoe models, historical canoes, canoe-sailing in the 1970s and outrigger racing recorded in Suva harbour last August. Professor Hooper is the world expert on Baron Von Hügel’s time in Fiji during the 1870s, and in 1990 co-edited (with Jane Roth) the Baron's Fiji journals. With the collaboration of the Fijian Art project's exhibition packages scheme and the Scottish Pacific Collections Review, the University of Aberdeen Museums have launched a new temporary exhibition at the King's Museum entitled Fiji, Scotland & the Making of Empire. Neil Curtis, the University's Head of Museums, has created an exhibition which explores the prominent role of the Scots in Fiji's early colonial history. The first British governor Sir Arthur Gordon, his cousin A.J.L. Gordon and the early colonial medical officer William MacGregor were all Aberdeenshire men. All three were influential in the early colonial administration and left collections of significant material to the University of Aberdeen. The exhibition draws on these remarkable collections, including some of the rarest historical Fijian artefact types. 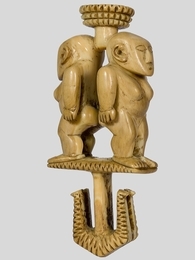 A good example of this is the University's very fine female double deity figure, of which only a handful are known to remain in the world; this one was given to MacGregor by Ro Matanitobua of Namosi in the 1870s, who told him it had been in his family for at least seven generations. Fiji, Scotland and the Making of Empire runs until 23 May 2014. (Above) Female Double Deity Figure (ABDUA 4651), currently on show in Aberdeen (Photo: University of Aberdeen Museums).